Up and Social is honored to work with Selling With Presence in support of their digital marketing goals. 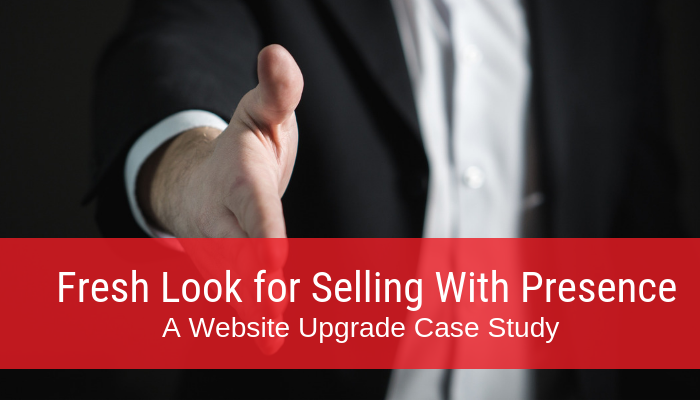 One of our latest achievements with Selling With Presence is the launching of their newest website, www.sellingwithpresence.com. The cutting-edge look of this new website we’ve developed utilizes brilliant, eye-catching colors, powerful imagery that captures the essence of selling with personal power, and a responsive design to convey their commitment to teaching sales essentials that win. Selling with Presence provides a comprehensive set of tools to sales professionals who need that extra boost in sales leadership. “Being average isn’t good enough anymore. You need to be better than the rest. A lot better,” says this dynamic brand. The company offers a variety of different programs to cater to the needs of sales professionals in various industries such as pharmaceuticals, technology, manufacturing, financial services, consumer goods, and more. Programs offered include instructor led, classroom training, self-guided online learning, as well as keynote addresses. The online learning courses feature two modules that can help sales professionals greatly improve their sales process from beginning to end. There are even more free resources, worksheets, and other valuable tools available on the site as well. Testimonials on the site offer a brief snapshot of just how valuable these programs are. “The workshop was the best two days of my career. Picture perfect,’ says Colleen Anderson, VP Human Resources with The Miriam Hospital. Another client, Tim Fortune, Vice President – Human Resources, Aircraft Owners & Pilots Association (AOPA) mentioned that the training staff creates a very comfortable learning environment to get objectives met with ease in his testimonial. The website also includes a blog loaded with helpful tips and best practices ranging from topics such as sales team presentations and psychological safety to calming the inner critic and resilience. One of our goals was to feature testimonials such as these prominently on the website to showcase real results from real customers. Another goal with Selling With Presence was to develop an online presence that can meet today’s industry standards as well as meet their individual needs. We developed a website that is organized through a user-friendly interface that allows for easy navigation. The website seamlessly provides detailed information for any type of visitor whether they are looking for online help, or an expert keynote speaker for a larger audience. The website features bold images that speak to their strong focus on leadership and achievement. One of the features we’re really happy about is the mobile responsive format that makes it easier for people to view their website online with a mobile device. The interactive main menu at the top of the site provides users with an easy way to navigate through a wealth of information about what Selling With Presence provides and how to learn more. This new design combines simplicity and organization to offer an excellent user experience. If you are a sales professional looking for ways to increase results check out Selling With Presence! You won’t be disappointed.